Same strap Hiscox provides with their Artist series guitar cases. 2"wide black nylon web with moveable pad and metal clasps. Vintage inspired wood hardshell case designed for Favino sized guitars! Shaped laminated wooden shell even follows the contour of the classic horizontal cutaway, arched top, smooth black leather-look exterior, brass latches, plush padded interior. Shaped laminated wooden shell even follows the contour of the classic horizontal cutaway, arched top, smooth black leather-look exterior, brass latches, plush padded interior. Vintage inspired case custom fitted for the Selmer-Maccaferri guitar! Durable case constructed of fiberglass. 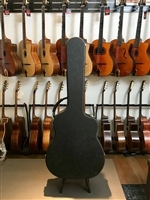 Case designed for Selmer style guitar (15 3/4" lower bout) Comes with backpack straps and small removable accessory pouch inside. Added protection for the toughest travel conditions! Compatible with the BAM Manouche as well as the AJL Fiberglass case! Beautifully constructed wood case for the Selmer-Maccaferri guitar. The most compact and well balanced wood case available. The design integrates a built in locking lid for increased strength and humidity control. The perfect companion when transporting your prized Selmer style guitar on flights or even to and from a gig. The perfect companion when transporting your Favino or DiMauro style guitar on flights or gigs. Lightweight and elegant carbon composite case for the Selmer-Maccaferri guitar! Lightweight and elegant carbon composite case for the Selmer-Maccaferri guitar! Cutting edge french case design for 17" archtop guitars! Cutting edge french case design for the Selmer Maccaferri Guitar! Can be coupled with the optional flight cover to withstand checked baggage conditions!